Why do I like writing this way? Why does anyone like writing this way? This might be a little bit of a cheat, but I have a leather pen case which I bought from China through eBay, and so I felt that this allowed me to add this show to the 'What's in my ...' series. So, I'll come clean and admit that I'm a fountain pen geek. Actually, it's worse than that: I've also been an enthusiast of pens and stationery in general for all of my life. It seems to run in families, because my son is a pen enthusiast, so is my daughter (to a lesser extent) and so was my father before me. With this in mind I thought I'd talk about fountain pens on HPR in case there are any other Fountain Pen Geeks out there. When I was at school, at about age 7 or 8, in the mid 1950's we were taught to write with ink pens, having previously been using pencils. The school provided a good supply of dip pens, nibs, ink and blotting paper. The pens were quite primitive, just a wooden shaft with a nib holder into which a nib could be inserted. The nib was a scratchy thing, which needed some care or it dug into the paper. We were each allocated a sheet of blotting paper too. Each desk had a hole in it for an inkwell, into which fitted a white ceramic open-topped inkwell. Most of the desks had a slider which covered over the inkwell to stop it drying out. The designated Ink Monitor got to fill them each week out of a large stone bottle. The colour of the ink was always blue-black. We were taught to write in the cursive style following the teachings of Marion Richardson. I guess this taught us good writing habits, though it didn't feel like that at the time. Later, at High School, it was expected that we'd write either with a ballpoint pen, or (preferably) with a fountain pen. Fountain pens were fairly cool in those days, and quite a lot of people had them. I think the ritual of buying or being bought a fountain pen was a sort of rite of passage during the transition to High School. I remember that there was much comparison of pens and degrees of rivalry over these pens in the school at that time. I guess this history made me like writing with a fountain pen. My experiences are not unique (of course). Many of my contemporaries and people older than myself who have been through the UK school system tend to be fountain pen users. I have also found that many people I have encountered in the worlds of science and engineering are keen fountain pen users. There are many nib styles, so finding one that suits your writing can give you a good writing experience, even though the hunt for that perfect combination can take a while. Using a fountain pen can be more economical. There are many good basic fountain pens out there, with many nib types for very reasonable prices. There are also many inks available, so once you have found the combination you like you can continue using them very cheaply for a long time. There is a certain novelty value in using one! 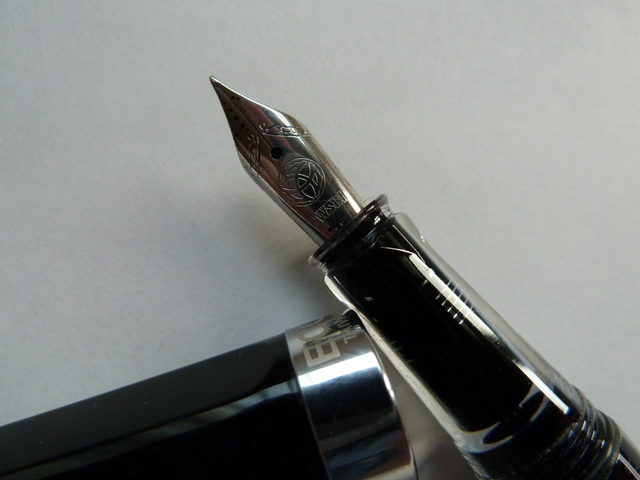 There are signs of a resurgence of interest in fountain pens ("Return of the fountain pen"). 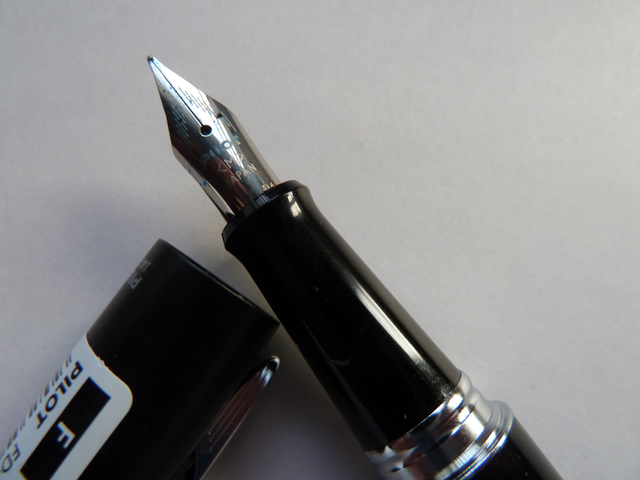 If you are not acquainted with the details of fountain pens I thought some explanation of a few terms might be helpful. A pen with a nib and an ink reservoir. The reservoir is usually refillable, though some disposable pens exist. The writing part of the pen. Usually metal of various sorts. They come with different tip sizes varying from extra fine, to broad. There is a variety of tip shapes too. A part of the pen nib. 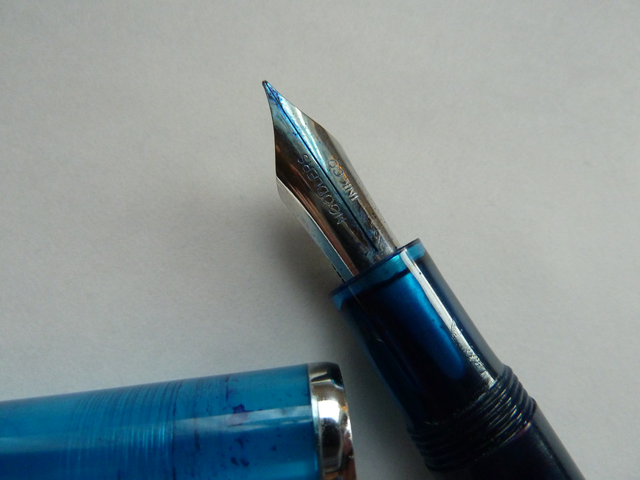 Usually a fountain pen nib has two tines by virtue of the fact that there is a split down the centre. This helps the ink flow to the end of the nib. The long part of the main body of the pen which houses the ink reservoir. The part under the nib which connects to the ink reservoir. This delivers ink to the nib through one or more channels by gravity and capillary action. The part of the pen into which the nib and the feed fit, and which is usually gripped when writing. Refers to the cap being removed from the nib end and placed on the end of the barrel. Sometimes necessary to balance a pen, but some writers prefer un-posted pens. An interchangeable ink reservoir which is normally thrown away when it is empty. There are two main international standard sizes but some pen manufacturers use their own designs. Some people re-fill their cartridges with a blunt hypodermic. 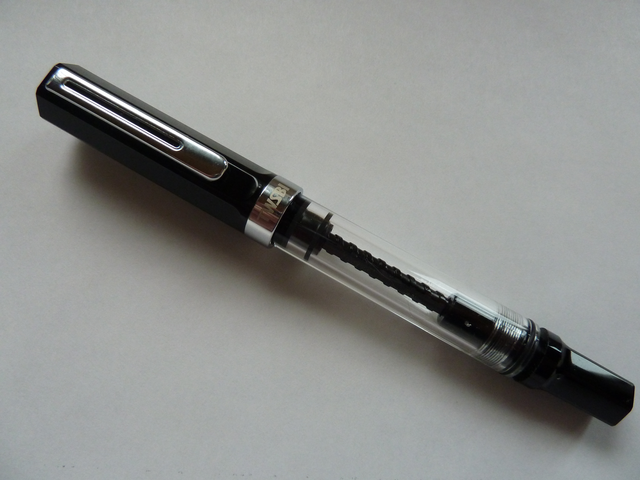 The reservoir of the pen is filled with a piston mechanism which draws ink up through the nib. The mechanism is usually operated by turning a knob connected to a plunger, though some use a simpler push-pull action. 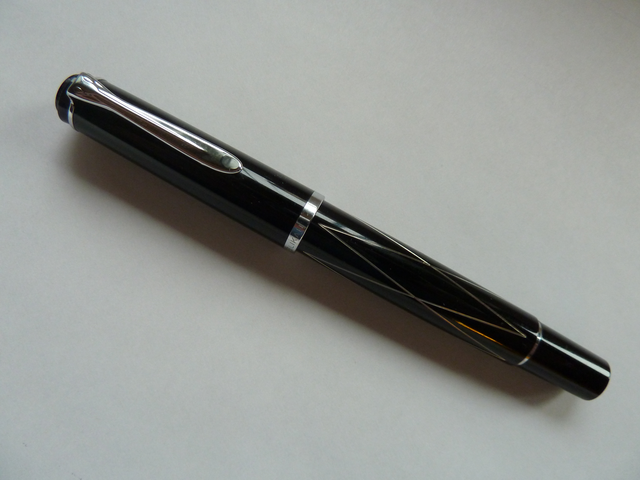 The piston mechanism is usually an integral part of the pen. 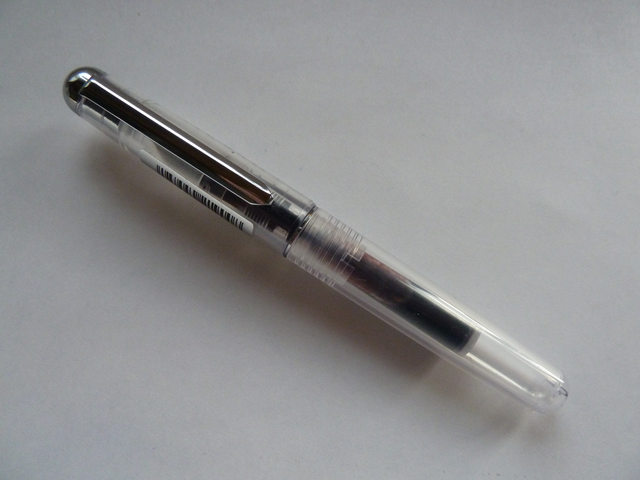 A device used to convert a cartridge pen into a refillable pen. Converters usually contain piston filling mechanisms, either threaded or simpler push/pull devices. A pen which is transparent, so its inner mechanism can be seen. These were originally just intended for salespeople to demonstrate the inner workings of the pens they were selling but the design caught on and is now quite popular. Compared to some collectors I have very few fountain pens. I currently have 19 usable pens, of which I use maybe 6 on a regular basis. I'll talk about my top 6 in this episode. 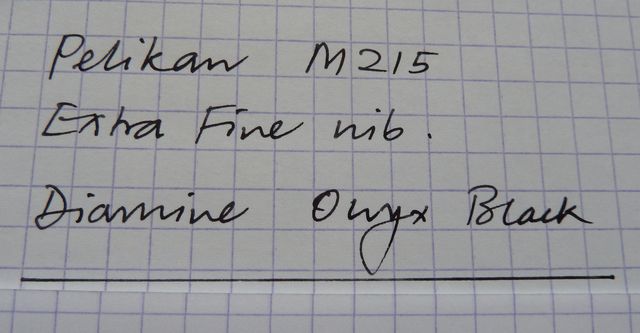 My style of writing seems to suit a fine nib, so I have tended to buy nibs classed as "Fine" or "Extra Fine". Pens which originate in Japan tend to have finer nibs than European pens, so a "Medium" Japanese nib is very similar to a European "Fine". 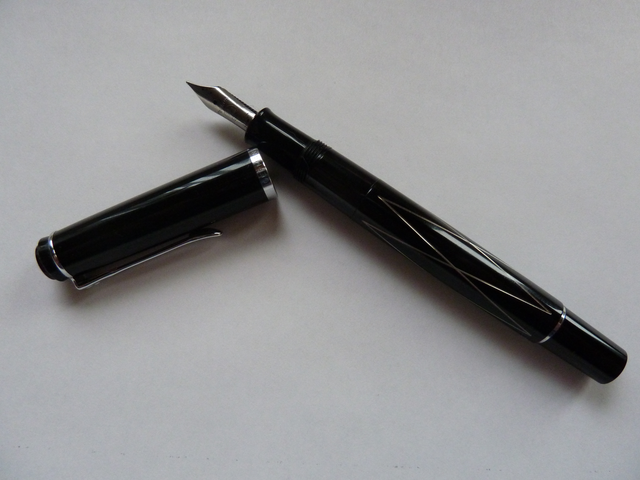 This model is also listed as the "Pelikan Tradition M215 Black/Silver Lozenge Fountain Pen" (see website). Mine was given to me as a Christmas present in 2012. The one I have has an extra fine nib, and writes beautifully. The nib is very smooth and ink flow is superb. The pen has a metal body and cap. Note how the clip has the look of a Pelican's bill; this is a distinctive feature of this brand. This is a fairly small pen, but that suits my writing style. It has a piston filling action with a knob at the end of the barrel. There is a small viewing window in the barrel through which you can see the amount of ink it currently contains. 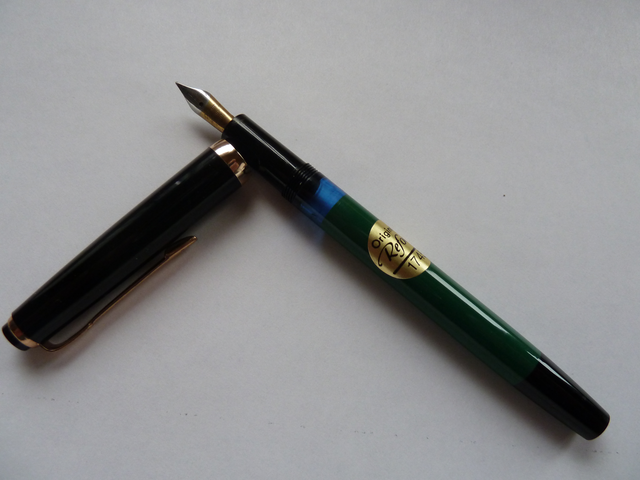 Pelikan is a German company which makes a large range of pens. The top end of their range can be rather expensive, however. This one is a quite a new model which I bought for myself in July 2015. 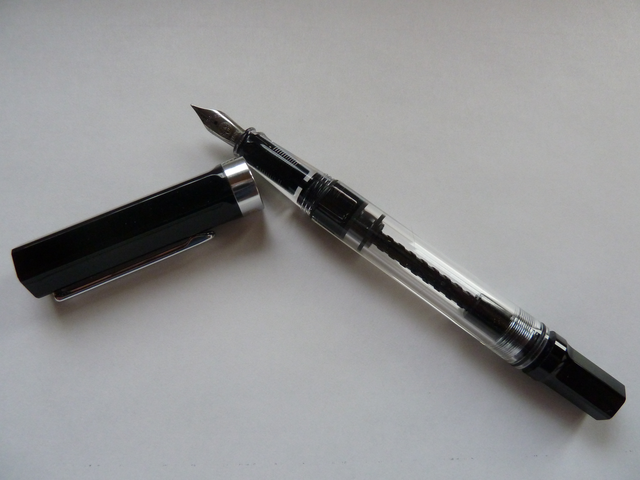 It is currently the lowest price model offered by TWSBI, at around £30. This pen is available in white or black. Mine is the black model with the "Extra Fine" nib. 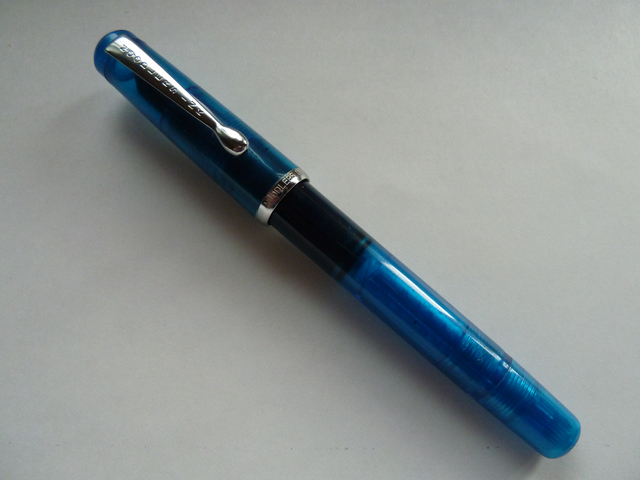 The pen is a "Demonstrator" as explained above, and is made of acrylic resin. It is filled by a piston action. The piston is operated by a knob at the end of the barrel. One particular feature is that the entire pen can be disassembled for cleaning and maintenance; there is a plastic spanner provided with it to help with this as well some silicon grease for lubricating the piston. The pen writes really well. It is very slightly scratchy, possibly due to my choice of the finest nib, but it is an excellent pen to use. The TWSBI company is based in Taiwan. I have bought two Noodler's brand pens, and I like this one the best. 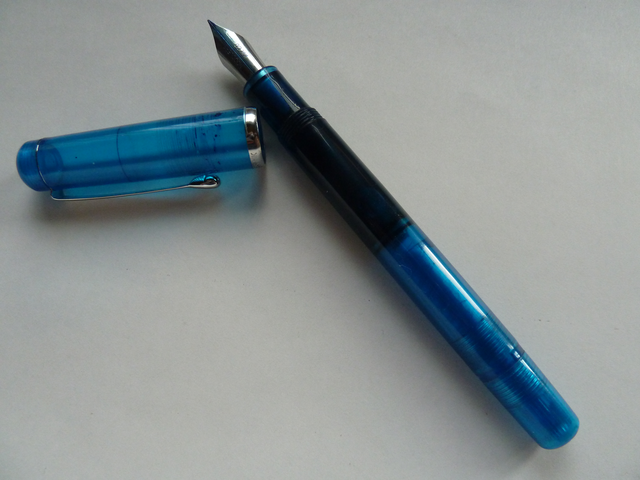 It is an inexpensive pen made of transparent blue resin. The colour is apparently called "Hudson Bay Fathom". The resin material used for the pen has a slightly odd smell. There are other acrylic pens in the Konrad range but they are about twice the price. This one was around £17. It has a medium-fine steel nib of an interesting design. Notice the split between the two tines extends a long way down the nib. 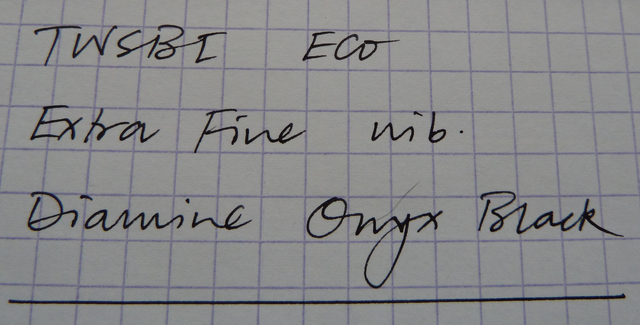 This nib is described as a flex nib. That is, the width of the lines it produces varies with the amount of pressure applied to the paper. This feature can be good for producing calligraphic effects, though I do not use this capability myself. It is a smooth and pleasant nib to use nevertheless. The pen is filled by a piston mechanism. It is necessary to unscrew a small cap from the end of the barrel to operate the knurled knob that moves the piston. Noodler's pens are made by the Noodler's Ink company in the USA. They are unusual and slightly quirky. I really like them and the Konrad writes well. This pen was a birthday present I received from my son in 2012. It's a small pen with what I assume is a fine nib - there is no indication on the nib itself. It has a piston filling mechanism with a knob which operates it at the end of the barrel. There is an ink viewing window in the barrel. 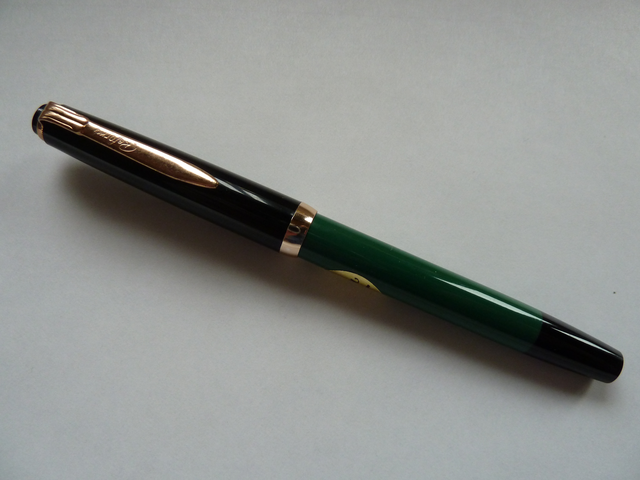 This model Reform pen is a small light pen in green and black with a copper-coloured clip. These pens were originally manufactured in Germany in the 1930's and 1940's and became very popular, especially with school children. At one time they were reported to be the best selling pens in the world, and manufacturing continued into the 1970's. 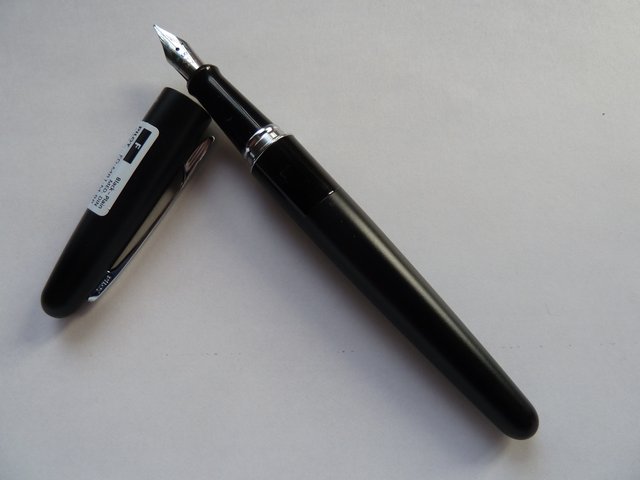 This model of pen is still available at quite low cost, though the quality of the nib is very variable. I have bought two more of these on eBay (around £12 each) to give as presents and found I needed to learn how to tune the nibs to give a good writing experience. I bought this pen from Amazon in July 2015 as an experiment to see what it was like. I had heard good things about it from various sources including fountain pen users on GnuSocial. Apparently it (or a version very like this European one) is sold as the Metropolitan in the USA. The pen I bought has a medium nib as indicated by the 'M' on it, but as mentioned elsewhere, this equates to "fine" in Europe since Pilot is a Japanese manufacturer. This is a cartridge pen, and it takes Pilot branded cartridges and international sized cartridges. I believe that the Pilot CON-50 converter can be used, but I do not have one at the moment. I found that the Waterman brand cartridge fits this pen, and this contains a larger amount of ink than the other options. It's a great pen and a good writer with a smooth and pleasant nib. For the price of around £15 it is excellent value for money, and is easily obtained. The Pilot Corporation is a Japanese pen manufacturer based in Tokyo, Japan. This was another recent purchase in August 2015. I noticed that these manufacturers, J. Herbin, who are usually known for their inks, were selling a fountain pen and a ballpoint pen. 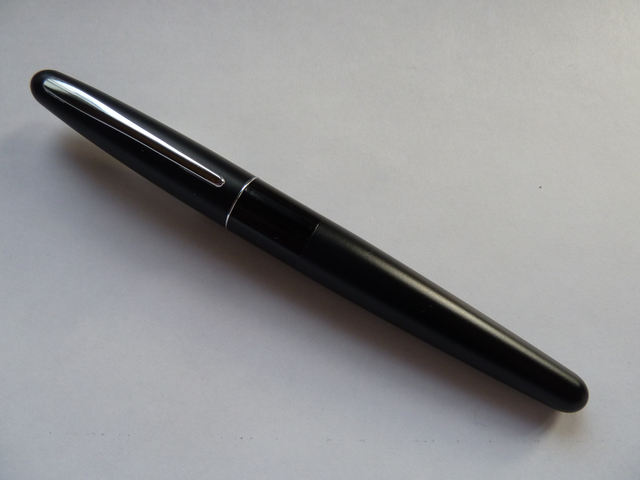 The ballpoint is refillable with fountain pen ink. I actually bought the ballpoint for my daughter, but she didn't like it. My son was keen to have it however and uses it often, he tells me. This pen is very small, measuring only 10cm (4 inches) uncapped. It needs to be used posted I find, to make it a reasonable size. It has a fine nib and the body is transparent. It cost around £8 and the transparent rollerball was £5. It takes international small cartridges, but I have managed to find a converter for it, though I haven't used it yet. The converter is made by Monteverde and is called the Mini Ink Converter. The pen is very pleasant to use and writes well. I bought J. Herbin ink cartridges to use with it, and tried out a reddish colour called Terre de feu. J. Herbin is a French company which sells inks, pens and other writing materials. As I mentioned earlier, I bought a case for my pens. It was found on eBay and originated in China so it's not anything much. 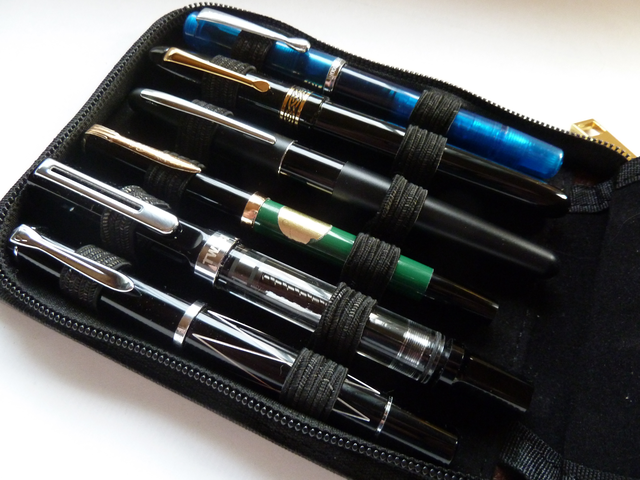 It's useful if I want to transport several pens at a time, but I don't keep my pens in it. I would like to find a better storage device, such as a better quality case or perhaps a wooden box. However, having a pen case at least allowed me to make up a title for this show! Pilot VPen or V4. This is a Japanese disposable pen with a medium sized steel nib. It is available in multiple colours and has a large ink capacity. In the UK it costs around £4. In the United States (and other countries) it is known as the Varsity. I have one of these and find it to be excellent. Platinum Preppy. This Japanese pen is made of clear polycarbonate. 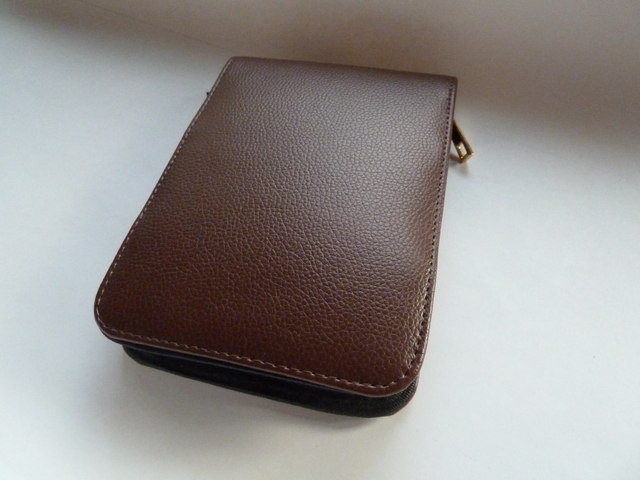 It is refillable with a proprietary cartridge, and several colours are available. An adaptor is available to allow it to use international standard small cartridges. It comes in three nib sizes: medium, fine and extra fine. In the UK this pen costs around £3. I have not yet tried this particular model. J. Herbin Transparent Fountain Pen. 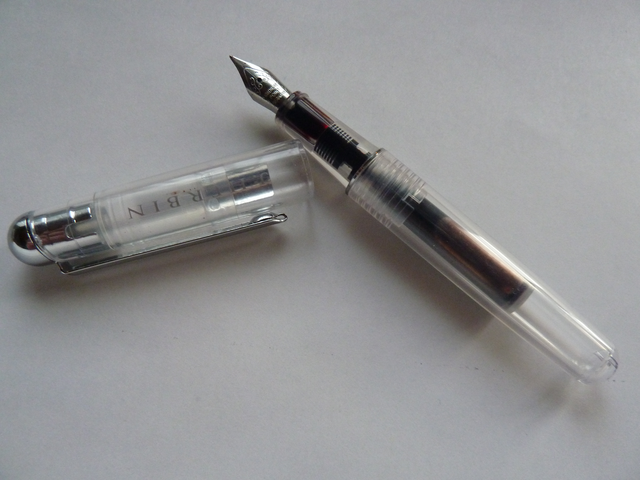 This is another clear pen which takes international small cartridges or a converter, as discussed earlier. The cost is around £8 in the UK. Pilot MR or Metropolitan. As already discussed. Around $15 in the US. 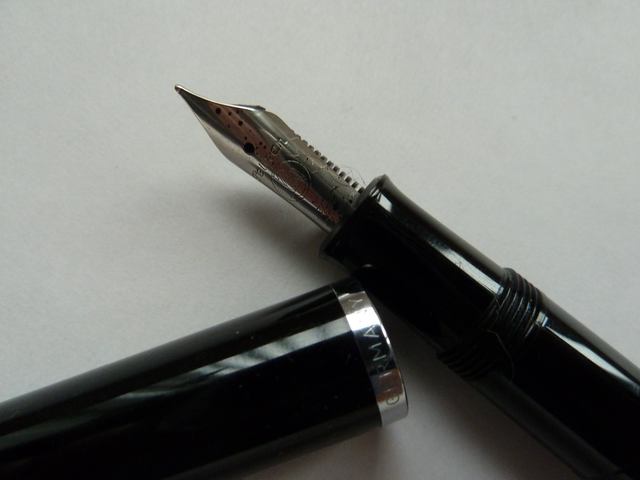 These are two subjects which are very much related to the use of fountain pens. I will not go into detail here, but the choice of paper and ink can be important to improve your writing experience. 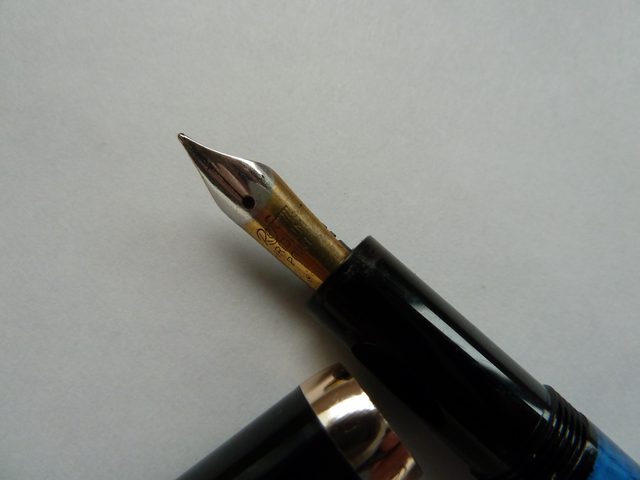 Choosing a good quality paper suitable for use with a fountain pen means that the pen will write smoothly, and the ink will not sink into the paper causing what is known as feathering. This is where the ink soaks into the fibres of the paper making the writing fuzzy and indistinct. Also, good quality paper can be written on both sides because the ink does not soak through, and the writing is not visible from the reverse side because the paper is thick enough. I like to use at least an 80gsm paper (gsm is grams per square metre, a measure of paper density). In the case of inks, there are huge numbers to choose from, with a vast range of colours. It is important to choose inks specifically designed for a fountain pen; there are inks designed for dip pens which will clog a fountain pen. A good basic ink made by a company such as Parker or Waterman is a good choice for people starting to use a fountain pen. 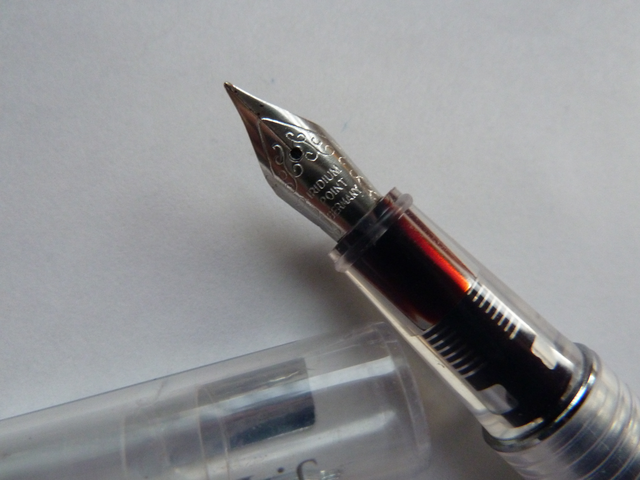 There is a large market in fountain pen inks, some of which can be expensive.